Calculation: The Median Absolute Deviation of the selected data set is the median of the absolute deviations from the median of the data set. 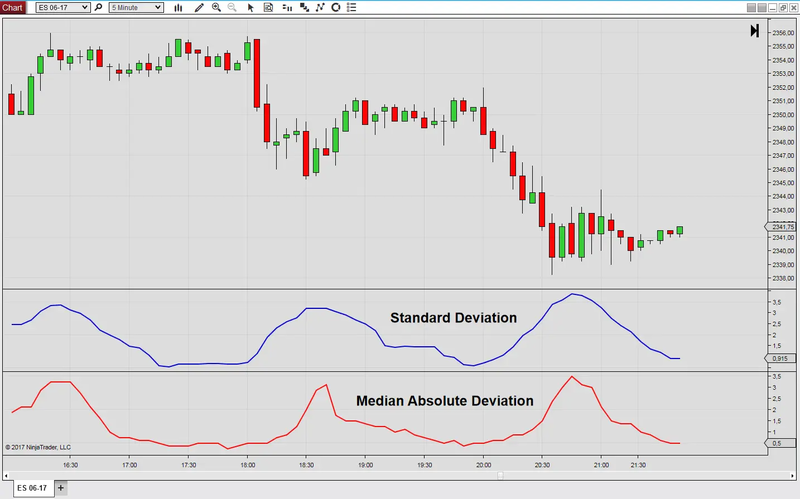 The Median Absolute Deviation is calculated from price data over the selected lookback period. We start with the calculation of a central tendency, such as the mean, median or mode of the selected input data. Next we find out how much the data points deviate from the central tendency and calculate the absolute differences dropping any negative signs. We take the absolute values of the differences and calculate the median. The indicator which can be downloaded here is the median absolute deviation around the median, which is often referred to as the “median absolute deviation”. This calculation is a much more robust measure of dispersion than the standard deviation. Large outliers will have a far lesser impact on the dispersion, when the mean absolute deviation around the median is used instead of the standard deviation.